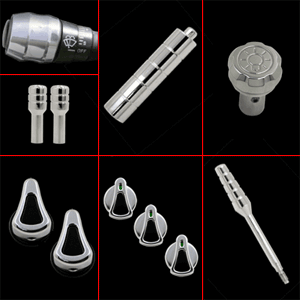 * High Quality Machined Billet Aluminum. * MGW Style Billet Accessories. 1 Billet 2 Tone A/C knobs with Blue Illumination Kit (3pc.) (1003-89-63) Innovative Bold Styling: Our Quality & Finish will leave you with a grin from ear to ear as it is the Best looking unit available for your Ford Mustang or Cobra. Quality Construction: Crafted to fit & function better than an OEM part, while giving you the bold clean styling of our aftermarket Dress Ups. All hardware included for a clean easy install in under 45 minutes for a Bold new look that will change your interiors look. Fits these Vehicles: 1994 1995 1996 1997 1998 1999 2000 2001 2002 2003 2004 LX GT GTS Mustang Cobra Shelby Roush Saleen Vehicles.